Born: 2 April 1883, Folkstone, Kent, United Kingdom. Died: 7 September 1964, Place not known. Hugh (Algernon) Godfrey Mundy, agriculturalist, was the son of Cyril Percy Mundy and his wife Caroline Helen Skottowe Mundy, born Dryden. He was educated at Dover College, Dover, England, and also obtained the diploma of the South-Eastern Agricultural College, England. He was subsequently employed at the Rothamsted Agricultural Experiments Station, north of London, and then at the Armstrong Agricultural College at Newcastle-upon-Tyne. 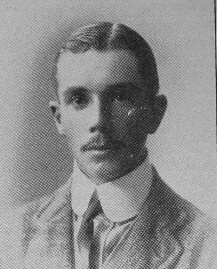 In June 1906 he arrived in the Transvaal Colony to take up duty as assistant for seed and plant introduction under the government agrostologist and botanist J. Burtt-Davey*, succeeding Mr H.C. Sampson*. He was stationed at the Government Agricultural Experiments Station at Skinner's Court, near Pretoria, where he started doing some experiments on cross-breeding maize. During the next few years Mundy published a number of notes in the Transvaal Agricultural Journal, on the following topics: Millets for hay, chicory cultivation, the spread of weeds, cultivation of hop, and weights of seed per bushel (1906/7, Vol. 5); his experiments at Skinner's Court, lucerne growing, experiments with winter grasses and other pasture plants, and rust resisting wheat (1907/8, Vol. 6); and winter pastures, co-operative experiments, wheat growing in the Transvaal, and (with W.H. Charter) cotton cultivation (1908/9, Vol. 7). In 1909 Mundy was transferred from the Department of Agriculture of the Transvaal Colony to the newly established Department of Agriculture of Rhodesia (now Zimbabwe), directed by Dr E.A. Nobbs*. He was appointed as agriculturalist and botanist, with his headquarters at the Agricultural Station in Salisbury (now Harare). Other employees included entomologist R.W. Jack* and agricultural chemist G.N. Blackshaw*. Mundy carried out experiments with many crops, including wheat, lucern, caster oil, cassava, sugar cane, hemp, cotton, flax, and fodder grasses. The results were published in the country's Agricultural Journal. He also introduced several new crops into the territory, including summer wheat, summer oats, velvet beans, cowpeas, teff grass, and sweet potatoes. In February 1911 he visited the Transvaal and Natal. Later that year he selected a site at Lochard siding, along the railway line some 50 km from Bulawayo, for the Matabeleland Experiment Farm, where he planned to conduct experiments with serials. He made a fairly comprehensive collection of Rhodesian grasses, which he took to the Royal Botanical Gardens at Kew, near London, in 1913. Collections were also made of agricultural and economic plants, and of poisonous plants. Mundy was absent from his post by the end of 1914, presumably on military service as a result of World War I (1914-1918). He later published a book, Sub-tropical agriculture in South Africa (with special reference to Rhodesia) (Salisbury, 1923). By 1925 he was chief agriculturalist in the Department of Agriculture, while F. Eyles* had taken over as chief botanist and mycologist. After the reorganisation of the department following the appointment of C.K. Brain* as director of agriculture, Mundy also became chief of the new Division of Plant Industry in 1930. Two years later he was appointed secretary of the reorganised Department of Agriculture and Lands, a position he still held in 1940. By 1911 Mundy had become a member of the South African Association for the Advancement of Science. In 1930, still living in Salisbury, he became a member of the Rhodesia Scientific Association. In 1909 Mundy married Alice Edith Field, but she died that same year. Ten years later he married Marjorie Mary Georgina Rose with whom he had three sons. Hugh Algernon Godfrey Mundy. Geni. Retrieved from https://www.geni.com/people/Hugh-Algernon-Godfrey-Mundy/6000000002096542303 on 2018-12-6. National Automated Archival Information Retrieval System (NAAIRS). http://www.national.archives.gov.za/naairs.htm Documents relating to Mundy, H.G. Southern Rhodesia. Report of the Director of Agriculture, 1911-1914, 1925-1930; and Report of the Secretary, Department of Agriculture and Lands, 1932-1940. Transvaal [Colony], Department of Agriculture. Report, 1905/6. Transvaal Agricultural Journal, 1906-1909, Vol. 5-7.